Is this part of President Obama’s “Jobs Program”? By Veronique de Rugy, NRO – While the private sector is struggling to grow and create jobs, there’s one area that is doing quite well: the federal regulatory business. Regulatory agencies have seen their combined budgets grow a healthy 16% since 2008, topping $54 billion, according to the annual “Regulator’s Budget,” compiled by George Washington University and Washington University in St. Louis. That’s at a time when the overall economy grew a paltry 5%. Meanwhile, employment at these agencies has climbed 13% since Obama took office to more than 281,000, while private-sector jobs shrank by 5.6%. 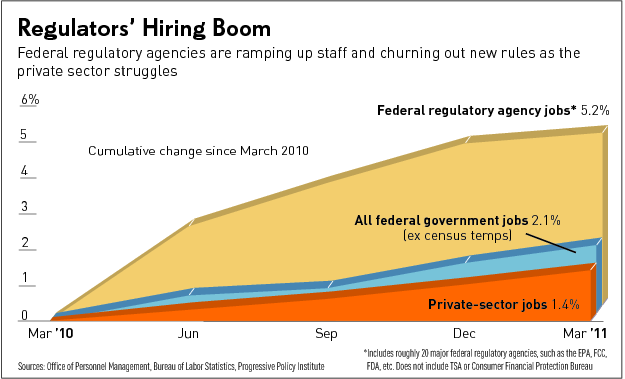 Michael Mandel, chief economic strategist at the Progressive Policy Institute, found that between March 2010 and March 2011 federal regulatory jobs climbed faster than either private jobs or overall government jobs. On a side note, I am in France right now, and I’ve been following the debate here over what to do with Greece. The fear of contagion to other countries, including France, is quite important. The question is how the banking system will surf this new potential cataclysm. Considering the exposure of U.S. banks in Europe, I guess Dodd-Frank and all its new bureaucrats will be put to the test sooner than anyone thought. Also, last week I participated in a New York Times debate over what the consequences of all these bailouts will be for the Germans, and why they aren’t protesting more. It’s here.